A decoding system for error controlling in transmission or recording of digital information data utilizes product code of minimum distance 2t constituted with two codes with minimum distance 2 and minimum distance t, this is realized by adopting a new decoding process suitable for manufacturing the system and capable of high speed decoding: thereby reliability in high speed transmission or recording system of digital information data is much improved. The present invention relates generally to decoding system, and particularly to decoding system capable of high speed decoding suitable for use in parity check in digital information data transmission or recording with high reliability. In transmission or recording and reproducing of digital information data, in order to prevent erroneous transmission or recording/reproducing of digital signal, data sequence is blocked into'a predetermined length, and coding is made for each blocked data. When reliability and error characteristic of transmission line or recording medium is not sufficient, there is a need to correct compound error wherein random error and burst error exist together. Then, by randomizing the burst error into random error by means of interleaving and the random errors are corrected. When the object of error correction is only the random errors, or the compound errors, higher error correction capability for random error contribute to higher reliability of digital information data. A product code has a characteristic that decoding the component code is easy with respect to its correction capability, and is good in harmonizing with the interleaving for correction of the compound error. And therefore the product code is becoming to be used for error correction in the system of transmission or recording of digital information data. In the code comprised of two or more ccnponent codes such as the product code, however, it is necessary that decodings of the component codes of the code must organically cooperate. For instance, in decoding of the product code constituted by two component codes, such repeated operation becomes necessary that after decoding a first component code, decoding a second component code is carried out by utilizing the result of the first decoding, and when necessary, decoding the first component code is repeated. Accordingly, in the decoding of the product code, though decoding of code of respective component code are relatively simple, process of the organic cooperation of the decoded results is complicated, and a general practical process has not yet been given. The situation is the same for the case of decoding process for the product code of two codes with a minimum distance 2 and a minimum distance t, which is a class of the product code, in transmission or recording of the digital information data, a high speed of processing is required for error correction, and hence, a method of high speed decoding of the product code becomes necessary. The purpose of the present invention is to provide a decoding system capable of high speed decoding of a product code of minimum distance 2t constituted with two codes with minimum distance 2 and minimum distance t, wherein, with respect to information of (kxk) symbols arranged in a matrix with k rows and ℓ columns, in each row a checksum symbol of ℓ symbols is added for constituting code with minimum distance 2, and in each of (ℓ+1) columns including a column for said added checksum symbols a set of parity check symbols are added for constituting code with minimum distance t.
In order to attain the above-mentioned object, the decoding system in accordance with the present invention performs a first decoding of (£+l) codes in column direction by a first decoder, and then a deciding on the decoding mode among three decoding modes by statistical processing of the error number flags issued from the first decoder, and finally a second decoding in which, responding to the decided decoding mode, the decoding is made as assertion of simple error detection, or single erasure error correction by using codes in row direction, or error detection by using codes in row direction. FIG. 1 is a diagram showing principle of constitution of a product code to which the decoding system in accordance with the present invention is applied. FIG. 2 is a flow chart showing process of decoding in the decoding system in accordance with the present invention. FIG. 3 is a set of schematical diagrams showing error corrections of various kinds in the decoding system in accordance with the present invention. FIG. 4 is a block diagram showing one embodiment of decoding system in accordance with the present invention. FIG. 5 is a block diagram of an inner code decoder 4 of FIG. 4. FIG. 6(a) is a block diagram showing an example of error number flag counter 7 of FIG. 4. FIG. 6(b) is a waveform diagram showing waveform of input signal to the error number flag counter of FIG. 6(a). FIG. 7 is a circuit diagram showing one example of circuit configuration of a pointer generator 9 of the decoding system of FIG. 4. Firstly, principle of decoding procedure to be used in the decoding system in accordance with the present invention is explained. FIG. 1 is a diagram showing constitution of a product code to which the present invention is applied. As shown in FIG. 1, the information data 1 are disposed in a matrix having k rows and ℓ columns. The component elements of the matrix is referred to as symbols here, wherein one above-mentioned symbol is represented by i-bit tuple. The checksum symbols 2 are obtained by making exclusive ORs between respective i-bit elements of ! symbols in each row of the matrix. Then, next coding is made with respect to each column of the matrix comprising the symbols (k x [ℓ+1]) for making a code with minimum distance t, and parity check symbols 3 consisting of r symbols are added to the (ℓ+1) columns, thereby obtaining (k+r) rows. The matrix having ([k+r] x [ℓ+1]) becomes a product code having minimum distance 2t. Here it is to be noted that, parity check symbols 3' for r symbols added against the (ℓ+1)-th column constitute checksum symbols 2' for the (k+l) -th row through (k+r)-th row. Also, it is to be noted that even when the order of coding of the rows and the columns may be interchanged, quite the same code can be constituted. Accordingly, the order of the coding between the rows and the columns does not limit the gist of the invention. Hereinafter, however, for the sake of simplicity of description, coding in rows is referred to as outer code and coding in columns are referred to as inner code; but these namings are not limited to the above-mentioned,and may be interchanged. represents a largest integar which is equal to or less than x. In the process of decoding operation of the inner codes, the below-mentioned error number flags Fi are set. for uncorrectable error or setting a flag Fj for erroneous j-error correction or setting a flag FO for composing a erroneous codeword by chance with the error. Thus, decoding of the (£+l) inner codes are carried out as above-mentioned. Nextly, (ℓ+1) error number flags obtained in the above-mentioned process are statistically processed, and as a result the following operations are classified into the following three modes. The above-mentioned statistical processing and subsequent processing are elucidated. Firstly, priorities are given to the flags in the order of from largest i sequentially to smallest i of Ci. And then, the following operations are classified in the below-mentioned correction modes. Now, this decoding is referred to as the first type decoding method. This is when the "Error detection" is made twice or more. (ii) Decoding mode II: This is when the Ci of the highest priority order in non-zero Ci's is 1. (iii) Decoding mode III: This is the case other than the above-mentioned two modes. (a) Decoding mode I: Detection of uncorrectable error is unconditionally asserted. (b) Decoding mode II: A pointer is put on a row of the inner code whereat an error number flag Fi for the Ci of the highest priority order in non-zero Ci's is 1. Then, checksum is made for outer codes of received sequence or read out sequence, and the checksum is added to the row on which the pointer is put on. Alternatively, the checksum of the outer codes are obtained with respect to the rows other than the pointer being put on, and the resultant checksum is substituted in place of the row on which the pointer is put. (c) Decoding mode III: Checksum by outer codes of the received sequence or lead out sequence are obtained and: (c-1) When checksum is 0, there is no error, (c-2) When the checksum is not 0, detection of uncorrectable error is asserted. arises. And checksums at outer codes of the received sequence or reproduced sequence are obtained, and the resultant checksum is added to the row on which the pointer is put through exclusive OR logic. Alternatively, the checksum of the outer codes are obtained with respect to the rows other than the pointer being put on, and the resultant checksum is substituted in place of the row on which the pointer is put. Hereafter, process of decoding in accordance with the present invention is elucidated on an actual example wherein minimum distance t of the inner code is 5 and hence minimum distance of the product code is 10. In this example, since the product code has the minimum distance 10, error correction of 4 symbols or less and error detection of 5 symbols are theoretically possible. FIG. 3 shows patterns for all cases of errors of 5 or less symbols. In FIG. 3, cases are classified by error number e occurring in the whole of the product code and further by error numbers of inner code in respective colums. The error number flags generated by decoding of the inner code are shown at the position below the respective columns. Though in the columns having no error the flag FO is generated, the flag FO is shown only for the case of e = 0, and in the cases of e = 1 or larger e the flags FO are omitted from the drawing for the simplicity. Furthermore, since the minmum distance of the inner code is 5, error correction for 2 symbols or less is possible for respective columns of the inner code. But in case of an error for 3 symbols or more, which is beyond the error correction capability, the error detection flag F3 is not necessarily generated. When errors of 3 symbols are generated in one column of the inner code like the CASEs 7, 10, 14 and 17, since the minimum distance of the inner code is 5, there are two liabilities of processing, namely, error correction being impossible or erroneous correction of two symbols being made. In the former processing a flag F3 is generated and,in the latter processing a flag F2 is generated. 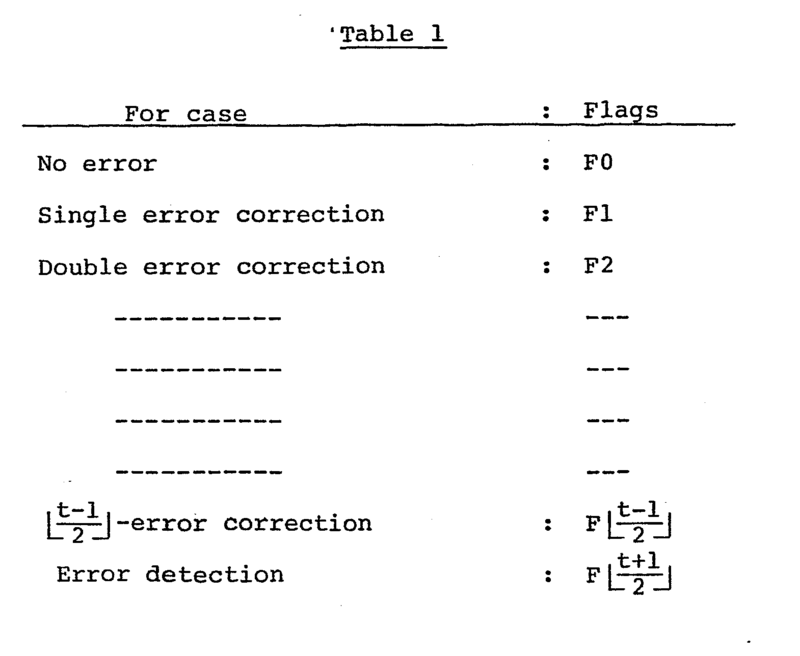 In the similar way, in 4 symbol errors of CASEs 11 and 16, either one of flags F3, F2 or Fl is generated; and in the 5 symbols errors of CASE of 18, either one of the flags F3, F2, Fl or FO is generated and classified. Classification of decoding mode in accordance with the aforementioned first type decoding method makes the following results. (B) Decoding mode II: CASEs 2, 4, 6, 7, 9, 10, 11, 13 14, 16(i), 16 (ii), 17 (i), 18(i), 18 (ii) and 18 (iii) . (C) Decoding mode III: CASEs 1, 3, 5, 8, 12, 15, 16(iii), 17(ii) and 18(iv). Among the CASEs classified in the decoding mode II, there is such a case that in decoding the inner code all the occurring errors are corrected, and even in such case processing of a single erasure correction using the outer code is carried out. In such case, there is no fear of addition of a fresh error by such correction processing. In the cases other than above, since errors in the column other than those put on with the pointer by the decoding of the inner code is appropriately corrected by error correction processing using the outer code errors in the column on which the pointer input are corrected. The decoding mode III is for detecting whether the error is appropriately corrected or not using the inner code, and detection of an correctable errors are asserted only for the CASEs 16(iii), 17(ii) and 18(iv). As has been described, in the example product code of the minimum distance 10, errors correction of 4 or less symbols and error detection of 5 symbols which is theoretically possible can be done according to the decoding method of the present invention. In the similar way, for the cases of the minimum distances 2, 3, 4 and 6 or more of the inner code, the theoretical possibility of error control ability can be proved. When the product code having minimum distance 10 as described in the preceding example is transmitted or decoded in the direction of row, namely in the direction of the outer code, and the decoding method in accordance with . the present invention is used, error correction is possible even when a compound error consisting of a burst error of 2 rows, i.e. 2 x (i + 1) symbol length or less and 1 symbol random error, or burst error of 1 row, i.e. (ℓ+ 1) symbol length or less and 2 symbol random error, or the like, arise at the same time. When the cases of error patterns are classified with decoding modes in accordance with the second type decoding method, classification becomes as follows. (B) Decoding mode II: CASEs 7(i), 10(i), 11(i), 14 (i) , 16(i), 17(i) and 18(i). (C) Decoding mode III: CASEs 1, 2, 3, 4, 5, 6, 7(ii), 8, 9, 10(ii) 11(ii), 11(iii), 12, 13, 14(ii), 15, 16(ii), 16(iii), 17(ii), 18 (ii), 18(iii), and 18(iv). In case the error is classified as the decoding mode II, apart from the decoding mode II of the first type decoding method, though there is necessarily at least an error at the code sequence where the pointer is put on, the code sequence other than that is appropriately corrected, and accordingly the error of the code sequence where the pointer is put on is rightly corrected by means of error correction processing using the outer codes. is considered. This third type decoding method also has the following three decoding modes. (B) Decoding mode II: CASEs 4, 6, 7, 9, 10, 11(i), 11(ii), 13, 14, 16(i), 16 (ii), 17, 18 (i) and 18 (ii). (C) Decoding mode III: CASEs 1, 2, 3, 5, 8, 11(111), 12, 15, 16(iii), 18(iii) and 18 (iv). As is obvious from the comparison with the first type decoding method and the second type decoding method, in the third type decoding method too, detections of uncorrectable errors are asserted for the CASEs ll(iii), 16(iii), 18(iii) and 18(iv). Accordingly, the performance of this third type decoding method is evaluated as that between the first type decoding method and the second type decoding method. Hereafter, one actual embodiment of a decoding system embodying the present invention is described with reference to FIG. 4 and thereafter. ). By utilizing error position data 403 and error value data 404 issued from the error enumerator 402, the correction unit 405 makes error correction against input data sequence 101 of one codeword stored in the buffer memory 401, and issues decoded data sequence 102. The most important process in the decoding system of the present invention is the decision of the decoding mode through statistical processing of the error number flags. Here, one plactical example to carry out the statistical processing of the error number flags for the product code having the minimum distance 10 is described. of error enumerator 402 shown in FIG. 5. When the error number flag Fi takes place, and a pulse as shown in FIG. 6b is generated thereby, the circuit shown in FIG. 6a counts the error number. The decoding system in accordance with the present invention necessitates classification of only three numbers of Ci namely, Ci = 0, Ci = 1 and Ci ≥ 2 for the nuniber of occurrence of the error number flags Fi, and therefore the circuit shown in FIG. 5 is enough. Responding to H-level and L-level of the outputs Fi0 and Fil of the circuit, number Ci of the occurrence of Fi are decided as shown in the following truth table. Accordingly, the decoding mode decision circuit 8 can be realized by combination of simple AND and OR logic circuits. Nextly, one example of the pointer generator 9 is elucidated with reference to FIG. 7. Pointer is necessary only when the case is the decoding mode II, and the decoding mode is not determined until completion of the decoding of (2+l) inner codes. Therefore, a provisional pointer is put on the inner code having possibility of the pointer being put on, and when error number flags of higher priority order arises, the provisional pointer is revised. FIG. 7 is an example of actual circuit of the pointer generation circuit. The circuit has three D-flip-flops 121, 122 and 123,output terminals of which are connected to a 4-bit cascadeable priority register 13(SN74278, made by TEXAS Instrument Inc.), and the D-flip-flops 121, 122 and 123 are cleared up by initial clear signal and set by the error number flags initially input thereto. The error number flags Fl, F2 and F3 are input to the D-flip-flops 121, 122 and 123, respectively, and the outputs from the flip-flops 121, 122 and 123 are input to the 4-bit cascadeable priority register 13 in the priority order of the error number flags. The register 13 changes its output only when an input of a higher priority order is inputted thereto. Output signals of the 4-bit cascadeable priority register 13 is given to the D-flip-flops 141, 142 and 143 and also to the NAND gates 151, 152 and 153, and when the output of the register 13 is changed from L-level to H-level, issues a short pulse. The short pulse is given to the AND gate l6, which accordingly issues output short signal PNT only when error number flag of higher priority order firstly arises. By this output PNT, address of the temporary memory 6 to which the decoded sequence 102 is temporarily stored is latched. Therefore the address of the temporary memory 6 which is latched by the last generated output PNT becomes a candidate of the pointer, and when the case is decided to be the decoding mode II, the latched address becomes the real pointer. In this second decoding method, the error number flag to be noted is only F3, and accordingly the pointer generation circuit 9 becomes so simple as shown in FIG. 8. As a result, the data to be recorded are coded into product code with minimum distance 12 represented by a matrix of (15 106). When the coded data are stored in the direction of the row, and the stored coded data are decoded by using the aforementioned first decoding method in accordance with the present invention, random errors in the sectors until five symbols are completely corrected, and in the view point of probability the random errors until 212 symbols can be corrected. By the same method, compound errors consisting of, for instance, one burst error of 212 symbol length and one" random error, or consisting of one burst error of 106 symbol length and any three symbol random error can be corrected. Since the decoding system of the product code in accordance with the present invention has rather simple decoding procedure and the decoding is completed by sequential decoding of two kinds of code, the configuration is simple and high speed operation is possible. Transmission or recordin/reproducing of digital information data at high speed and with high reliability is possible and the system has a great industrial utility. a second decoder which, responding to decoding modes decided by said decoding mode decision means, carries out an asserting of simple detection when the case is said decoding mode I, carries out erasure error correction to the codeword in a column on which an error number flag of said highest order priority in the set of error number flags which are counted once or more is given by utilizing a code in said row when the case is said decoding mode II and carries out error detection by using a code in a row when the case is said decoding mode III. error detection asserting means for asserting arising of an uncorrectable error when said checksum (10) generation means decides that all the checksums are non zero in said decoding mode I and in said decoding mode III. a second decoder which, responding to decoding modes decided by said decoding mode decision means, carries out an asserting of simple detection when the case is said decoding mode I, carries out erasure error correction to the codeword in a column on which an error detection flag is given by utilizing a code in said row when the case is said decoding mode II and carries out error detection by using a code in a row when the case is said decoding mode III. generation means decides that all the checksums are non zero in said decoding mode I and in said decoding mode III. (10) generation meaps decides that all the checksums are non zero in said decoding mode I and in said decoding mode III. responding to said decoding modes selectively carrying out an error detection, single erasure error correction or error detection using a code in a row, thereby to make error correction and error detection as the whole product code. EP19840110958 Expired - Lifetime EP0136604B1 (en) 1983-09-14 1984-09-13 Decoding method and system. EP0364475A1 (en) * 1987-06-08 1990-04-25 Exabyte Corp Multiple pass error correction process and apparatus for product codes. FR2717644B1 (en) * 1994-03-15 1996-04-26 Alcatel Mobile Comm France A method of coding - interleaving and deinterleaving method corresponding - decoding. FR2533782A1 (en) * 1982-09-27 1984-03-30 France Etat Equipment for recording and reading digital data on analog video disc, and provided with means of protection against errors. EP0592229A3 (en) * 1992-10-07 1995-06-14 Samsung Electronics Co Ltd Multiple error correcting method.